Note: Due to network difficulties, today’s show did not air live on WQOM in our usual time slot of 4-5 pm on Tuesday, December 20. We are publishing the show here with the audio and transcript, as well as in our podcast stream. The show will air on WQOM in its entirety as a “Best Of” show on Tuesday, December 27, from 4-5pm. Thank you for your understanding. Summary of today’s show: Bishop Arthur Kennedy, rector of St. John Seminary, just celebrated 45 years in the priesthood. Scot Landry and Fr. Chris O’Connor discuss with Bishop Kennedy his recent ad limina visit with Pope Benedict in Rome; his childhood in West Roxbury; his formation and ordination in Rome in 1966; and the many years he spent in academia, teaching the Catholic faith to university students. They also talk about Bishop Kennedy’s favorite author, Flannery O’Connor, and his assessment of the young people he’s confirmed throughout the Archdiocese since his ordination as bishop last year. 1st segment: Scot asked Fr. Chris how he celebrates Christmas now that the seminary is not in session. Fr. Chris said he will be helping out at St. John in Winthrop and Sacred Heart in East Boston, which are close together but unique. St. John is a typical suburban parish and Sacred Heart is a melting pot of the city with several ethnic groups living there. He will celebrate the 4pm and 6pm Christmas Eve Masses. On Christmas, he will spend it with his family at his sister’s home in Stoughton. Scot said his family will travel to New Bedford where his brother Roger is pastor of St. Anthony Parish. They will attend 4pm Mass and then have a dinner after in the rectory. On Christmas Day they go to the 9am at St. Agnes in Arlington, where his daughter sings in the children’s choir. They will gather with both sides of his family afterward. Fr. Chris said it’s easier on pastors when Christmas is on a Sunday because they don’t have to double up on Masses. He said he hopes people who come back for Christmas for the first time since the new translation came into effect will find it edifying. Also, this Wednesday, all the church and chapels of the Archdiocese will have confessions available from 6pm to 8:30pm as part of The Light Is On For You. You can find a church at PilotParishFinder.com. 2nd segment: Scot welcomed Bishop Kennedy to the show. Scot said he was ordained to the priesthood on December 17, 1966 and is celebrating 45 years in the priesthood. Bishop Kennedy thanked Scot and said it’s a good time to be rector because it shows the young men the life of the priesthood can be remarkably rewarding and filled with the mystery of God. What God does in us is what we really celebrate in this 45th anniversary. On September 14, 2010, Bishop Kennedy and Bishop Peter Uglietto were ordained bishops for Boston. They recently met with all the bishops of New England with Pope Benedict for his first ad limina visit. It’s a pilgrimage to the tombs of the apostles, first of all, so they celebrated Mass at the tombs of St. Peter and St. Paul as well as Bl. John Paul II. They also met with the Holy Father for about 40 minutes and they each spoke to him about some aspect of the work of the new Evangelization. Bishop Kennedy talked about the Theological Institute for the New Evangelization that they have undertaken at St. John Seminary. The Holy Father emphasized how all evangelization begins with catechesis. They then met with various Vatican offices, including the new council for the New Evangelization, where they were very excited about TINE for their work. He also met with the Congregation for Education ad Seminaries. They talked about the New Evangelization too, especially how they train and form lay people and how that relationship affects how they form and train seminarians. They also talked about getting permission to have a pontifical degree at St. John’ Seminary. Scot asked what is a pontifical degree. Bishop Kennedy said it is based on a system worked out by the Vatican on what is required for coursework. It includes a special ordering of coursework and provides the opportunity for a seminarian being able to go for further study to have a leg up than he otherwise might. Scot said it seems like the holy Father is particularly interested in talking about the New Evangelization in these meetings with bishops. Bishop Kennedy noted the Holy Father is dedicated to seeing this become a major dimension of his papacy because this was his focus for many years in his own academic work. New Evangelization re-opens the light that is so dangerously closed off by many of the dark elements in modern culture. Scot asked how the Pope seems to be doing as a man in his mid-80s. Bishop Kennedy said he looked quite frail when he saw him in September. He’d been told by his doctors to lose weight and he’d obviously done so. He looked tired; this was after World Youth Day in Spain and just before his trip to Germany. He was more invigorated when they saw him November, but still quite frail. Fr. Chris asked what else he sees as his legacy in his papacy. Bishop Kennedy said the way he’s been able to bring into the life of the Church that its development is always organic. It doesn’t bounce around by rejecting things of the past, but integrates new things in to the structure of the life of the Church. The way he was able to bring in an understanding of the Second Vatican Council as a continuation of the Church’s life. Scot said he’s often viewed Pope Benedict’s heart is tied to the renewal of the Liturgy because how we pray informs our faith. Bishop Kennedy said he guided the development of the new translation into English. 3rd segment: Scot said Bishop Kennedy grew up here in Boston and asked him how he first heard the call to the priesthood. Bishop Kennedy said he grew up in West Roxbury and Holy Name was his home parish. Msgr. Charles Finn was the pastor and four more priests lived there. He said the laypeople were very involved in the parish. The laity were the ones who made all the details of life go: Boy Scouts, Girl Scouts, bands, choirs, athletic teams, etc. There was a culture and form within that culture he had a sense of vocation. The unity between the priests and laity was extraordinary. He saw how holy laypeople could be and dedicated to prayer and prayed not just for themselves but for others. They had many vocations from that parish when he was growing up. The Archdiocese had a program—which he’s reinstating—called the St. Botolph Guild. St. Botolph’s name is the origin of the name Boston: St. Botolph’s Town. He’s the patron saint of the city of Boston. The guild were boys and young men interested in the priesthood who went once a month to the seminary for a holy hour, reflection, and meeting the seminarians. They learned the seminarians were just like themselves. His family was very close to the Church as well. He went to Boston Latin School for high school where he studied Latin, Greek, French and German as well as other subjects so he had a very good engagement entry into a broad world of interests. Scot asked him about not attending a Catholic high school. Bishop Kennedy said there was no Catholic high school near them at the time. He studied for seminary at St. John Seminary and then at the Pontifical North American College, and was ordained in St. Peter’s Basilica in Rome. At the time, they had one telephone call per year back home on Christmas Day, so all communications were by letter. Thus the planning for the ordination was complicated as 34 people came with his family. The ordination took place at the Altar of the Chair, which is the altar behind the main high altar in the center of the basilica. He celebrated his first Mass at the Basilica of St. Clements, which had been under the care of Cardinal O’Connell. Holy Name parish’s apse had been copied from the basilica so the artwork and design was quite familiar to him. He served in several parishes and then went for further studies after which he has spent the bulk of his time in academic work. He worked at the University of St. Thomas in St. Paul, Minnesota. He said it was a very Catholic place, but even those who were not Catholic were still very devout. He spent eight years helping at one parish and 22 years in another parish in downtown St. Paul. The academic world was something he’d begun to enjoy even when he was in high school. He was interested in theology and how it helps us understand all of the dimensions of the mystery of Christ. So he taught theology to undergraduate students. Many of them came from small farm towns and were the first in their families to go to college. There was a greater sense of nature from students who grew up on farms. He said when you’re sitting on a tractor all day, there’s a lot of time for contemplation of the universe and one’s place in it. He started courses that linked theology to other social sciences, like literature and philosopher and more. They created a Catholic studies program, which has become very successful. It links the Catholic life of prayer, service to the Church, and a life of charity. It’s amazing how many vocations have come from students in that program. It was the first program of its type in the country and became the model for many others. Fr. Chris said Bishop Kennedy is known for his love of Flannery O’Connor, the souther Catholic writer. He said she had an amazing vision from the time she was about 18. She saw the great difficulty between faith and culture. In her world the Christians were principally not Catholic. She had a great sense that the grace of God works by allowing all of those who are informed by the Gospel to be able to recognize their place and their dignity and be drawn closer and closer to understanding the darkness of the world and their need for redemption. Her stories are always about redemption, how people resist redemption or find it only after great suffering. She is completely unsentimental. She recognizes that grace is a very difficult reality because it faces difficult things. Sometimes you show the reality of grace by showing what life is like when it is absent. She had a sense of the darkness that was coming, even back in the 50s when every thought things were fine. She saw the decline of education. She had a great spiritual sense of self. At 19, she wrote in a spiritual journal: “Go must be in everything I write.” As far as he can see, she fulfilled that command right until her early death at the age of 39 from Lupus. He would recommend people who want to start reading her books to start with the collection of her short stories called “A Good Man Is Hard to Find and Other Stories ”. Scot said Bishop Kennedy earlier said the Catholic studies program he started tried to link Catholicism with other disciplines and there were a number of vocations that came from it. Does he think that those two are related? Bishop Kennedy thinks it opens one’s imagination to possibilities that might be closed off by the culture. It’s a terrific entire sense of the human community and the mystical Body of the Church. It’s exactly the way the Church was engaged in education for centuries. It’s only in the last decades that we’ve divided up these areas of education. The integrity allows young people to see how faith takes nothing away, but gives them a whole new way of being human. Scot asked how he implements it at St. John’s. Bishop Kennedy said they’ve established a summer reading program, including for example, books on economics so they can relate to people’s concerns; history books like those of the Catholic historian Christopher Dawson. Bishop Kennedy said Dawson made him realize that when faith is lived by Catholic people in society, they transform everything else. They change economics and education, for example. Dawson said we hadn’t linked our knowledge of theology with our knowledge of history. For example, the great churches are prayers in stone. It’s part of what they do at St. John’s. They do it through human formation and spiritual formation. 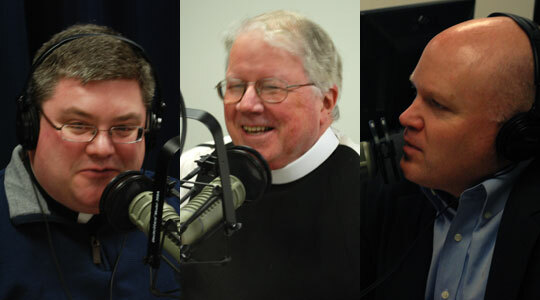 4th segment: Scot noted that Bishop Kennedy in June 2010, Cardinal Sean invited then-Fr. Kennedy and then-Fr. Uglietto to a meeting and told them that the Holy Father wanted to make them bishops. What was it like? Bishop Kennedy said at the time Cardinal Sean was heading to the US bishops meeting in Washington, DC, and they’d been talking about talking to bishops there about the seminary. So he got a phone call asking him to come meet the cardinal The Cardinal said there’s good news and Bishop Kennedy asked, “Oh, do you have some bishops who are going to send some men to St. John’s Seminary.” The cardinal said, “Oh no, the holy Father has named you an auxiliary bishop of Boston.” He replied, “What?” So Bishop Kennedy wasn’t able to tell anyone for a long time and then had to write a letter—you have to make a formal response to the Holy Father’s request—which he did after much prayer and fasting. The ordination Mass saw many bishops come from around the country on the Feast of the Exaltation of the Cross. After the ordination, you walk down through the Church and give your blessing to all the people and he saw the enthusiasm of the people in the full cathedral. They don’t know him, but the enthusiasm is that the Church continues to have those offices and places and people who will continue to carry on the mission of the Church. the enthusiasm is about the Church and that was the most wonderful part for him. Fr. Chris said Bishop Kennedy travels around the diocese and performs many confirmations. What has he learned about the youth of the archdiocese? Bishop Kennedy has them write to him before he goes to the confirmations. He asks them to tell him the name they’ve chosen for confirmation; the sponsor and why they chose that person—many of the young people say the sponsor is a model of Christian fidelity; and what do they understand by the Mass. From those questions that he gives his reflections from the homily. He quotes from the letters and talks to the family members about what their children are saying. He then talks about how the young people have to become models themselves. He’s been impressed by the catechetical preparation in many parishes. In some parishes, it’s been so good that the young people ask to be able to continue to meet as a class with the pastor and catechists. It’s important because it can seem that confirmation is a graduation from Church, but it’s really the exact opposite case. So he talks to them about Pope Benedict’s talk to the students in England and Wales. He said it’s unusual for anyone to talk to all of the children in England, Scotland, and Wales, never mind the Pope. He told them that he was there for the beatification of Bl. Newman. He told them that they all have to consider becoming saints so they need to think about what a saint is how they would become one. Confirmation is one of the steps to becoming a saint. Scot said when he hears bishops talk about confirmation, there is a lot of variety. Cardinal Sean likes to talk about marriage, not knowing for how many of them this will be their last homily before they approach their pastor to get married in the church. He tries to help prepare them for their next sacrament. Scot said he loves Bishop Kennedy makes them reflect before coming forward for the sacrament. Scot said he’s always been fascinated that bishops get to pick on quote from Scripture and make it their episcopal motto. He’s often thought if he tried to boil down his life to one phrase, what would it be? Bishop Kennedy picked, “Ut cognoscant te”, which translates as “That they may know you.” Cardinal Cushing had the same motto. It’s from John 17:3. Bishop Kennedy picked it because it’s first in the Book of Wisdom in the Old Testament. It is the way he’s spent his life as a pastor and a teacher, helping people to know Christ. It also gives an historical link back to Boston. Scot said Cardinal Cushing built so many churches and schools, that this motto is in about a third of the buildings in the Archdiocese on his coat of arms. Scot asked if there’s anything in his first 15 months as a bishop that has surprised him. Bishop Kennedy said he’s been amazed by how many letters he’s received from former students who recall something he’s taught them or his presence at some event and the gratitude that comes back to him. It reminds him of the way in which when you live your life according to charity and sacrifice, that God’s work is taking place in others and you have no idea. It’s the hiddenness of God’s redemption. Fr. Chris said on behalf of St. John Seminary how blessed they are to have Bishop Kennedy lead them and impressed by his kindness and generosity and intellect. Bishop Kennedy said for a long time he’s tried to link faith to culture and he’s trying to help the seminarians do that by giving them a greater sense of the faith they’ll see in the young people they’ll be serving in the parishes. People are waiting for these men to come be faithful spiritual fathers in the future.